A transformation in technical approaches and business processes is called for. But it won’t be a transformation powered by Windows Mobile. DARPA specifies that “initial interest will focus on apps developed on the iPhone or Android platforms”. The idea is to find apps which will be helpful “especially among the end-users at lower levels in the military echelon”. 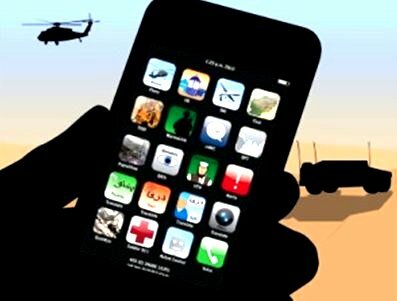 Famously there are already apps for the iPhone which can make ballistic calculations for a sniper. Other existing software which would obviously help a soldier could include various kinds of navigation kit, user interfaces for remote drones – again, several of which are already on offer – and so on. Some military hardware, too, has already taken on many of the aspects of a smartphone – for instance the Land Warrior wearable comm/puter rig. And in fact, no matter DARPA’s perferences, at least one maker has produced a covert version of military belt-computer software to run on a Windows smartphone. DARPA, unusually, would seem to be very much with – or even a bit behind – the times on this one. The agency normally prefers to be well into the future. Full instructions for developers to submit whitepapers to DARPA can be found here.